Mistletoe in Art? Probably an odd concept to most people. 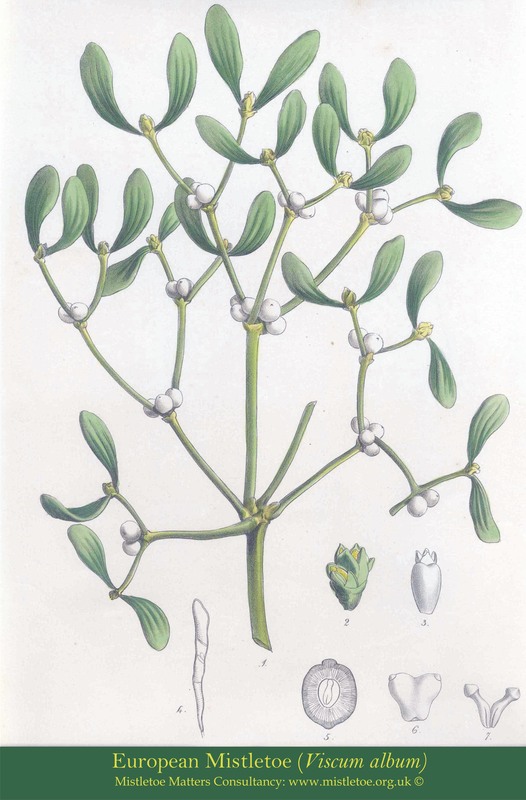 But with its distinctive shapes and colours (there aren’t many other white-berried plants) the traditional European mistletoe has a long-established place in both seasonal and non-seasonal art. Examples of seasonal Christmas and New Year art are presented lower down this page. Christmas mistletoe imagery is common everywhere today, but New Year material is more of a continental Europe tradition. European mistletoe is a very distinctive plant – and not just because it has white berries in mid-winter. It also has very distinctive branching and leaf patterns. Mistletoe’s distinctive branching pattern, leaf-pairs and berries are perfect for art nouveau design, and from the 1890s through to the 1930s were regularly used in designs from continental Europe. There was often an association, at least in France, with the tradition of mistletoe as a symbol of luck and peace at New Year, with many items inscribed with the phrase ‘au gui l’an neuf/nouveau’ – gui being the French word for mistletoe. 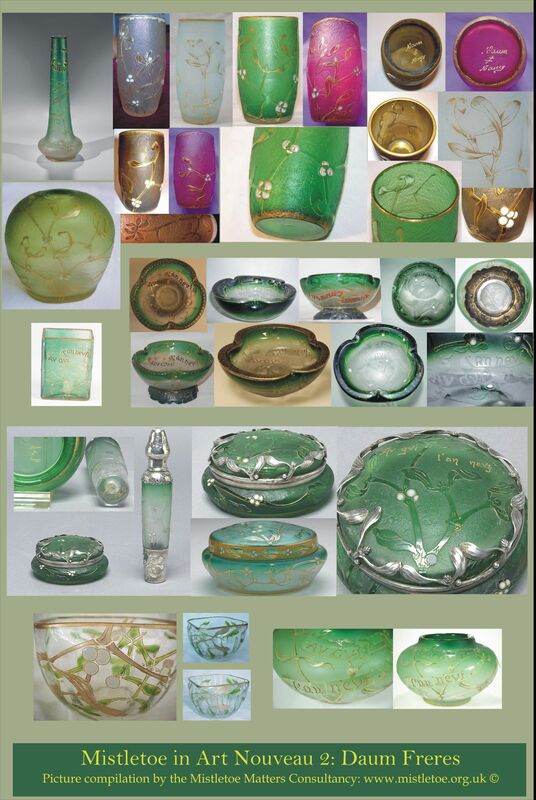 A few examples of art nouveau design are shown here – without any detailed interpretation, just to demonstrate the range and style of some of the items. 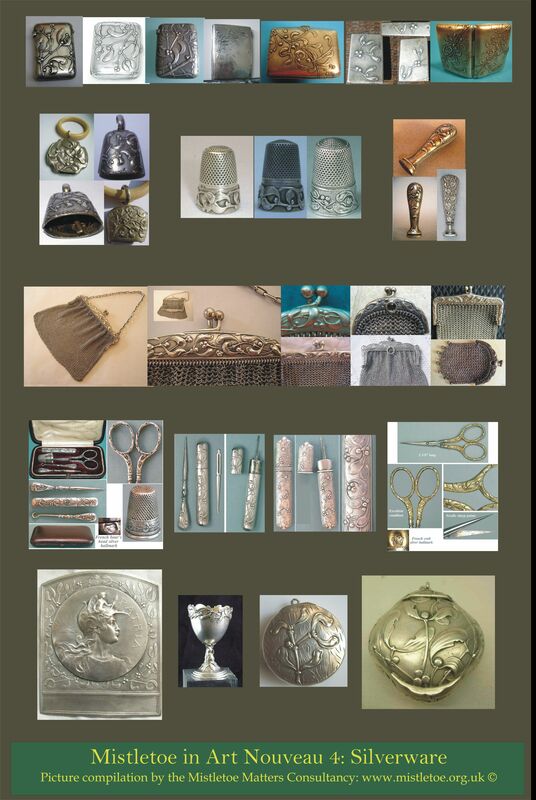 Some posters with illustrations of items from this period, are available for download lower down this page. Rene Lalique’s Gui bowl c 1921. This bowl was produced in several colour variants. Click to enlarge. Rene Lalique’s Druide Vase c 1924. This vase was produced in several colour variants. 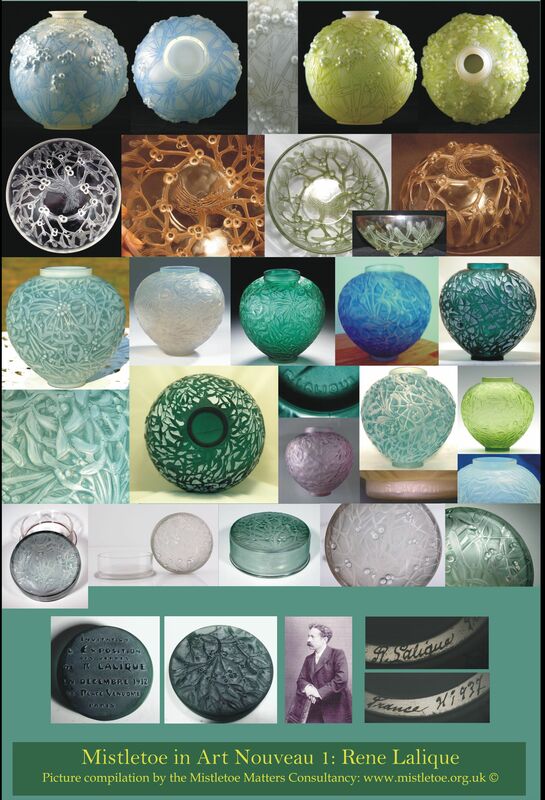 Rene Lalique’s Boule de Gui Vase – also made in various colurs and finishes. Click to enlarge. A glass beaker by Daum Frères, based in Nancy, France. Click to enlarge. The china mark from a mistletoe-themed dinner service by Boch Frères Keramik, Belgium. ‘Gui’ is French for mistletoe. 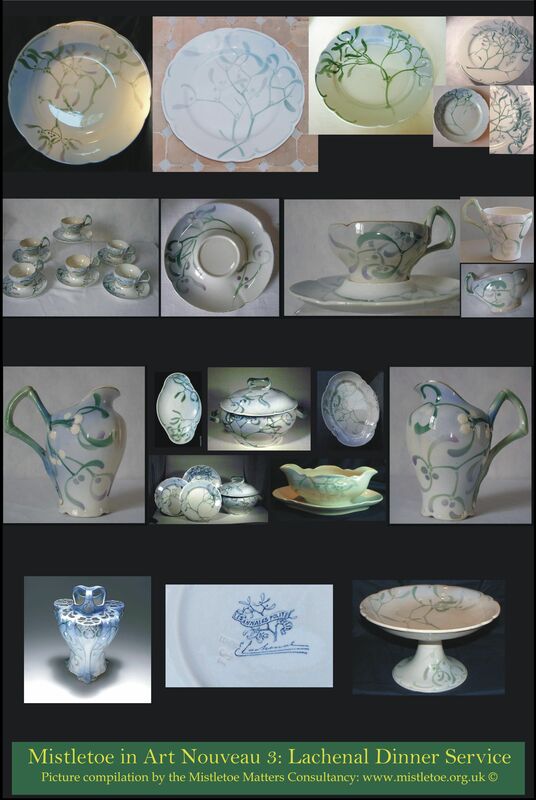 Plates from a dinner service designed by Edmond Lachenal in the 1890s. Made by Luneville exclusively for subscribers to Les Annales Politiques et Littéraires. Click to enlarge. 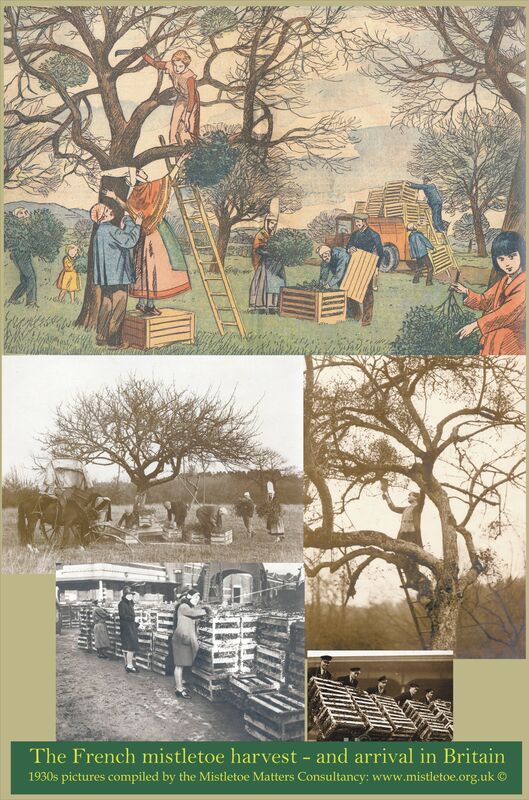 The Mistletoe Matters Consultancy has several posters available to download, including a historic botanical print, a series of art nouveau posters and a poster about mistletoe harvesting in France in the 1920s and 30s. Scroll down to see them all. Botanical Mistletoe Poster to download: It’s a large file (about 1.2 MB) and is optimised to print at about 300 by 450 mm. Click the image to download it. Mistletoe Art Nouveau Posters to download: The Mistletoe Matters Consultancy assembled some examples of art nouveau mistletoe for an exhibition in 2005, and some of the resulting posters are available to download here. Click the links below to download each one – they’re large files between 1 and 4 MB in size and optimised to print at about 300 by 450 mm. 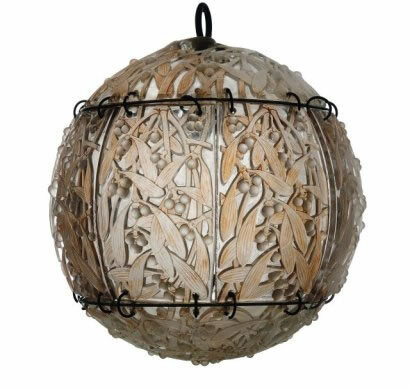 Visit our Mistletoe Art pages for full information about mistletoe imagery in the art nouveau period. French Mistletoe Harvest Poster to download with some vintage (1920s and 30s) pictures of the French Mistletoe Harvest and export to the UK. It can be downloaded here (or click on the image). Note that it is a large file (about 4 MB) and is optimised to print at about 300 by 450 mm. The English Mistletoe Shop has a small stock of mistletoe postcards and other cards featuring historic prints of mistletoe and mistletoe Art Nouveau designs. The postcards are in 2 packs, each with 4 cars. Click here or the links below the images to visit the shop.